Uttoxeter betting tips page with all the Uttoxeter Racecourse facts to assist you with your tipping and Uttoxeter betting. If you want to be on the right side of your wagers check out all the stats and facts below. There will be informative horse racing tips from OLBG members with plenty of helpful advice that will assist all punters, whether you are a novice or an expert. Uttoxeter in Staffordshire races on 25 days of the year and is the only racecourse in the county. The fences are not especially arduous with speed and fatigue rather than the fences causing horses to fall. It is a speedy track when the going is good, however when it rains a stayer is needed as the course takes on a different demeanour. Speedy horses can over race when the going is good and be picked off by those who have reserved energy on the run in. Taking the inside line is the choice of most jockeys, however in the back straight being wider can give an advantage at the next turn. Uttoxeter’s location means it attract horses from the north and south generally leading to decent sized fields and competitive racing, you generally see a good race at the course. Bookmakers Streaming Services: Ladbrokes, William Hill, Bet 365. The track is a left-handed course of 1.3 miles. Fairly tight in nature but does favour those with stamina in abundance when the going is testing. The Midlands Grand National is a great race as it tends to attract horses who have swerved the Cheltenham Festival handicaps specifically for this £70k race. David Pipe won the race 4 times between 2011 to 2014 with different horses. It's notable that trainers like to book good claimers to take off a few lbs and as the race is over 4 miles those lbs can make all the difference. A claiming jockey has won the race 8 times in the last 20 years. The other notable Uttoxeter race is the Listed Summer Cup run in late June. Because the ground is normally decent at this time of the year you get a fast run chase, with the lead changing hands on numerous occasions. It attracts big fields (15 runners+) and has not seen a winning favourite since its inception in 2012. 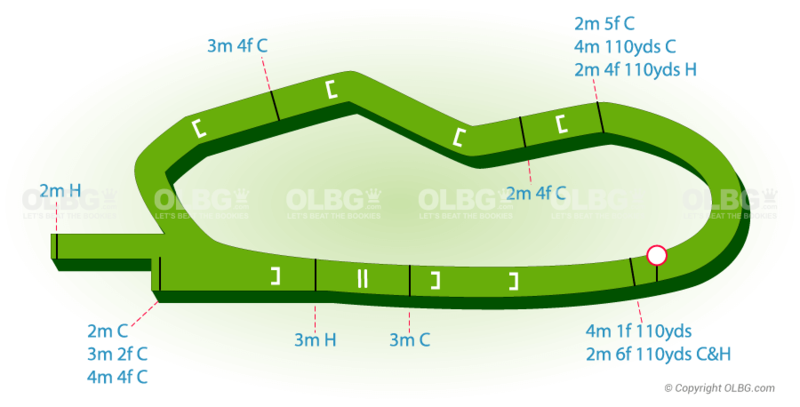 Uttoxeter also holds a range of Class 2 and 3 handicaps both over hurdles and fences. If you are off to Uttoxeter races today then why not download the OLBG app to get all the latest Uttoxeter tips at the course. Trainers who generally have a lot of above average horses in their stables do well at the track. Prize money tends to be decent but the two leading trainers in the country, Paul Nicholls and Nicky Henderson, know that their horses entered at the track are in for a tough race and their results in comparison to other courses are not great. More so Paul Nicholls who has had no winners from 18 runners since the start of 2013 and doesn't send many to the Midlands track. Likewise, Nicky Henderson (2 winners from 11 runners here in 2018) has a better strike rate at other tracks. Trainers sending a handicap chaser here from running in a chase at Chepstow (9 winners from 42 runners) or Bangor (9 winners from 41) last time out have a good record here. OLBG tipsters adding tips on Uttoxeter's outright favourites would be showing a healthy strike rate (40%) and level stakes profit since the start of 2014 (319 wins from 795 races, £53 profit to £1 stakes). The Uttoxeter favourites tend to go off at decent odds because of the races generally being competitive with plenty of runners however the market leader has certainly been a steady profitable source for winner finding. OLBG members are experts on National Hunt racing, check their horse tips at Uttoxeter. Who are the best jockeys and trainers to bet on at Uttoxeter ? Dan Skelton is certainly becoming the trainer to follow here at Uttoxeter with 60 winners from 196 runners (30%) since the start of 2014. Dan had a fantastic 2018 here with 36 winners from 97 runners (37%) and showing a £48 profit to £1 stakes. Dan shows a level stakes loss in non handicap races and his record in bumpers is only 2 wins from 13 runners in that same period so you could do even better by focusing on just his handicap hurdlers and chasers.